Bridge column, March 28: How do you start dummy's trumps? Confucius said, "There are three methods to gaining wisdom. The first is reflection, which is the highest. The second is limitation, which is the easiest. The third is experience, which is the bitterest." Reflection -- analysis -- is the best way to find the answer to a deal. But we should not wish to limit our knowledge. And experience can make life easier, although, it is true, gaining it can be painful. What in your wisdom -- opinion -- is the right play of the trump suit in this four-heart contract? West leads the club queen. South loses the first three tricks, then wins the fourth with his spade ace. This was a good deal for Stayman, since three no-trump fails. (Declarer, unable to get to dummy to take the heart finesse, should end with only three spades, three hearts and two diamonds.) Use Stayman when you have minimum game points and a low doubleton (or singleton or void), as the North hand does here. South must first get into the dummy by ruffing the third diamond. Then, since the trump finesse might need to be repeated, he must call specifically for the heart nine. When that holds, he continues with the heart queen. 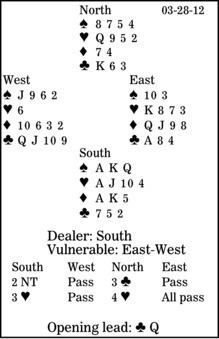 Here, assuming East does not cover, Declarer then plays dummy's last heart to his jack, cashes the ace, and claims. Note that if South starts with dummy's heart queen, unblocking his 10 or jack, East should duck the first round and cover the nine-continuation to guarantee himself a trump trick. When you need to repeat a finesse, first lead the lowest card that can hold the trick if the finesse is working.